St. Ignace II Huron Village and Jesuit Mission 1648-49, probable site of St. Ignace II overrun and destroyed by the Iroquois March 16-19, 1649; St. Jean de Brebeuf and St. Gabriel Lalemant were martyred here March 16-17, 1649. When I go to this site I do not get the impression that the Church is overly committed to this place as the sacred ground of 2 saints. 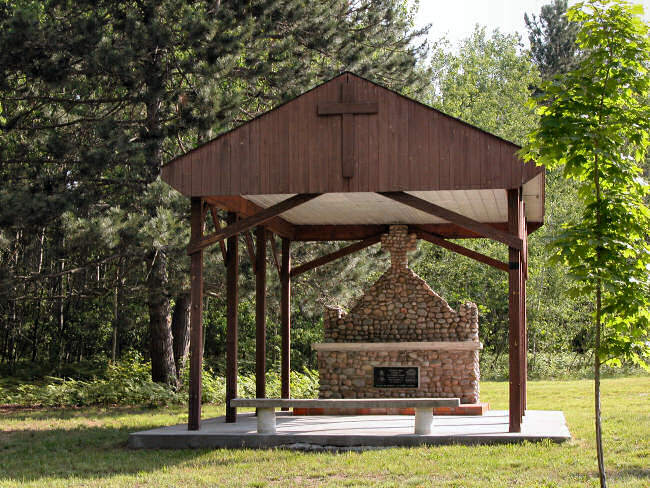 The picnic shelter and marker in it seem more to commemorate Arpin, the person who found this location than the saints themselves. The 2 crosses at the back of the site are the apparent sites of the martyrdoms but say nothing. According to the eye witness accounts of the martyrdoms it is not clear as to if the 2 priest could even see each other durring this time. These 2 crosses are quite close together and there is no obvious sign of where the church may have stood even though Jury did some excavation here when he confirmed to the Church that this was the correct place. 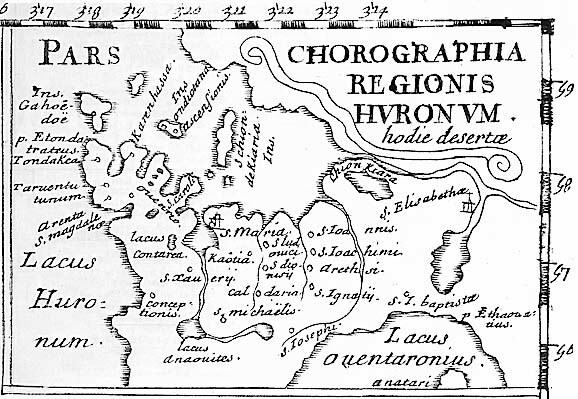 I have a lot doubt about this location and think that both Ste Ignace and Ste Louis were much closser to Ste Marie. Worth further studdy I think, but I'm not sure by whom. There should be a decriptor sign post as you enter and there should be one on the grounds near the martyrdom posts (which is being repaired). The monument plaque to Alphonse Arpin was donated by his grandson, Michael Bernier, who also helped finance the shelter over the altar. On Wednesday afternoons during the summer at 3pm, a Mass is celebrated there. The cross is centred between two stone markers where burnt wooden posts were found. I put simulated posts up near those markers for World Youth Days in 2002 where 1000 pilgrims from around the world prayed- walking from Martyrs' Shrine to St. Ignace II. 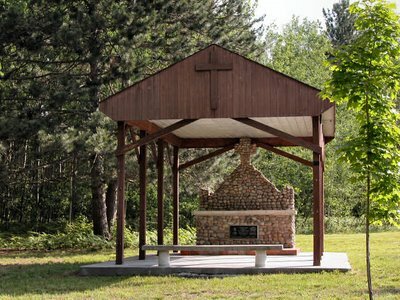 The priests and others were tied to the roof support posts of the church at St. Ignace II, at least that is one interpretation of Jury's findings. As well, I put beams to outline the foundation of the church but they were moved so the maintenance crew could cut the grass easier. You can see a distinctive hump in the ground identifying the location of the church's foundations. I do not know if they were created in 1946 when the site was excavated by Jury. Interestingly- the church is oriented tru north south, just as Brebeuf's grave in the Church at Ste. marie I.
I think the site is kept simple for security/insurance reasons- there has been vandalism there over the years, so the more sparse the site is, the better for it so it will not be desecrated. I plan to check a couple of things out this summer. The roof support posts are in line with one another (every 11 feet) so there should be more to find. They are cedar and I have a couple of them believed by Fr. Hegarty to be the posts that Sts. Brebeuf and Lalemant were tied to.